We are happy to announce that we will be exhibiting at Lab Innovations in Birmingham at the NEC. Please visit our Weighing Team on Stand G15. Featuring patented technological advancements including Auto Precision Assessment (APA), Impact Shock Detection (ISD) and Flow Rate Display (FRD), the Apollo balance range is Laboratory Precise yet Industry Strong and takes weighing precision and protection to new heights. 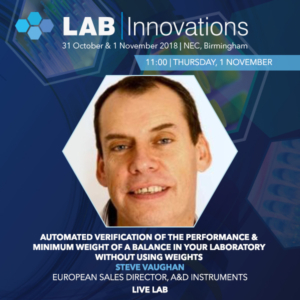 Come along and listen to our European Director of Weighing, Steve Vaughan at the LIVE Lab (11:00 – 11:30), who will talk about testing the repeatability and performance of balances in YOUR lab WITHOUT the need of calibration weights. Checking the performance of a balance and calculating its minimum weight is an important factor in ensuring accurate weighing in regulated laboratories. In this practical demonstration, A&D’s European Director of Weighing, Steve Vaughan will outline a patented new technology from A&D called Electronically Controlled Load™ (ECL), which allows automatic precision assessment of a balance and determination of minimum weight, at a simple touch of a button. 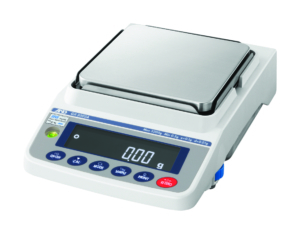 You will also be able to get hands on with the FX/FZ-iWP which offers laboratory level performance suitable for use in any environment where dust & moisture can be problematic, this IP65 rated Precision Balance has proved itself over and again in science, industry and academic environments, withstanding the largest of spills. Come and see the live demo at Lab Innovations for yourself! 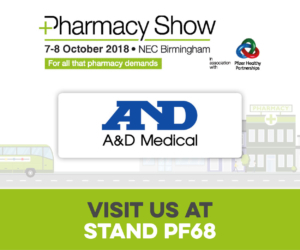 At the beginning of the month, a team from ADI exhibited at The Pharmacy Show 2018 in Birmingham, the largest sourcing and networking event for pharmacy professionals in the UK. The team worked hard to showcase A&D’s medical products to over 8,900 pharmacy owners, wholesalers, buyers, distributors and decision makers, in a dedicated trade environment to the pharmacy market. We showcased UA-611Plus, SmartCheck and AFib+ technologies and with the intense focus on screening for Atrial Fibrillation across the country due to it being the most common sustained cardiac arrhythmia affecting about 1.3% of the population in England and Wales, this attracted a huge amount of interest from pharmacists. One of the highlighted presentations at The Pharmacy Show was “Capture AF Community pharmacist led Atrial Fibrillation Detection and Treatment Programme”, showing the growing importance of AF screening. 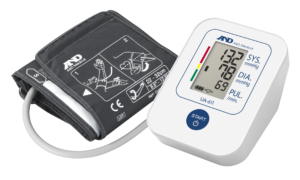 A&D are well placed as being in line with supporting the increasing role of the pharmacists in AF detection and management with the development of the range of AFib+ medical devices. 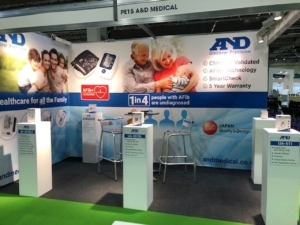 All around a successful show for A&D Medical.